His close partner Najib could not do much as within UMNO itself there are so many warlords and they know that the party is under attack and both hands are not clapping in unison. On one hand the President Najib has indicated that the Football Licence will be approved and the other the party is welcoming 40 Ulama’s to its fold. He will be contend for now though to sing Josh Grobans Song to Najib.”Suddenly I am Falling, Lost in a Dream” You say those words and my heart stops beating. ( LICENCE REJECT………}How far we’ve come and I celebrate every moment. Do you know how I love you..Najib? The end result is what matters in football matches. True,everyone in the football fraternity sympathises with Rob Green for his”Howler” which also cursed former England keepers in David Seaman, Paul Robinson and Scott Carson. They have lived to tell their tales but the mistake by Rob Green in the England versus USA World Cup Game the Bookies certainly loved him. Why..?? The Handicap Odds England 1 ball accorded to USA. The Finance Ministry has yet to issue a sports betting licence as the government is still sourcing feedback from the public on the matter. In a written reply to four MPs, Finance Minister Najib Abdul Razak said the government had also yet to finalise the terms and conditions of the permit. Some BN Grassroot supporters called audie61 and said,” The PM has listened to the people on the ground and he does and will not be pushed around eventhough it will generate revenue for the Government. Of course the opposition will say,” They have won a moral victory” but the Government above all should be commended for PUTTING A STOP TO SPORTS BETTING. HOPE THIS IS NOT B.S. 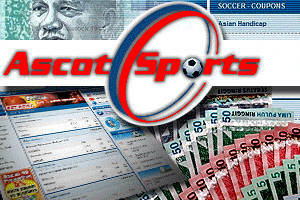 Earlier Article filed:-The federal government’s recent decision to re-issue a sports betting licence to Ascot Sports Sdn Bhd continues to be the popular topic – this time in Parliament, as independent and opposition parliamentarians submitted their questions. This is in addition to widespread opposition and public demonstrations against the licence issued to the company owned by business tycoon Vincent Tan. Tan (right) had recently defended sports betting and said that he will donate to charity the proceeds – amounting to half a billion ringgit – from the sale of Ascot Sports to the Berjaya Group. “What is the fun of watching sports without betting,” he had quipped. 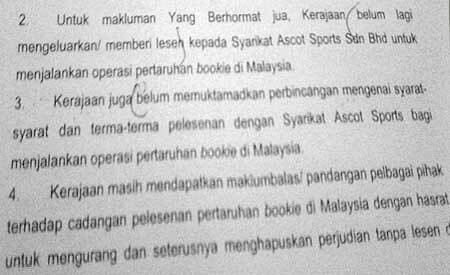 Up to four questions and one motion with regards to sports betting were recorded in today’s order paper, one each from Tian Chua (PKR-Batu), Ibrahim Ali (Independent-Pasir Mas), Khalid Samad (PAS-Shah Alam) and Anthony Loke (DAP-Rasah). Tian Chua wanted the government to reveal why it cancelled the licence in 2004 and its rationale in reissuing it now. “Why did the government issue the licence without open tender?” he asked further. Ibrahim and Khalid wanted the government to explain why it persisted with issuing the licence in spite of it clearly contravening Islamic values and facing strong opposition from various segments of society. Loke asked whether the government had considered the impact that the legalising of sports betting will have on society. “The goverment should also justify why it approved the licence to Ascot Sports, why was the company chosen?” asked Loke in his question. Zulkifli Noordin (Independent-Kulim Bandar Baru) went a step further, following up with a motion for debate, moving for the house to urge to government to cancel the sports betting licence. “It contradicts Syariah law and may give the wrong impression to youths that sports and gambling go hand in hand,” said Zulkifli (left) in his motion. Due to lack of time, the questions were not answered this morning. But written answers are expected later today or early tomorrow. Zulkifli’s motion however may also not see parliamentary debate as priority will be given to government business.